The Hemphill Power & Light Company received a letter from the local office of the Occupational Safety and Health Administration (OSHA) regarding a concern about health hazards due to fugitive dust and potentially explosive conditions. Hemphill Power & Light retained Tech Environmental to investigate the situation, respond to the iwc replica watches Â­OSHA letter, and ensure that worker safety was not at risk. Tech Environmental performedÂ­ wood dust level monitoring inside the Processed Fuel Room of the Hemphill facility, the location with the highest potential for dust and worker exposure. 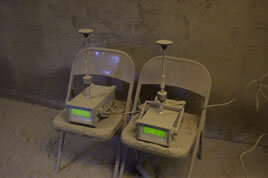 The monitoring measured both total dust and respirable particulate using DataRam monitors. The 8-hour Time Weighted Averages (TWAs) were shown to comply with OSHA standards. To ensure worker safety, however, Hemphill issued personal protective equipment to its workers and trained them in the use of that equipment. Tech's particulate testing confirmed that there was a low level of fine particles in the air at the Hemphill facility, and that a concern of explosive conditions was not warranted since the majority of particles present were small-pulverized product, not fine dust particles. The analysis showed that the levels of fine dust were not sufficient for explosive conditions. Although the testing results did not require further action, Hemphill investigated modifications to the ventilation system to further ensure worker safety and comfort. An energy facility received a letter from OSHA raising concerns about worker safety due to fugitive dust and potentially explosive conditions. Tech Environmental performed a thorough assessment and confirmed that that levels of fugitive dust were within OSHA standards.